BRUCE MICHAEL HALL ("Joe") - after graduating from the prestigeous Theater Arts program at the University of Southern California, Bruce went on to be a regular lead in the TV series "One Life to Live" and "Passions". Other guest starring roles have included spots on "Summerland", "Boston Public", "Frat Rats", and "You Can't Take It With You". Bruce also has a sizable following from his musical career with the country western rock band, ROWDY, that he started with his identical twin brother, Seth. Interestingly enough, Seth is a practicing pharmacologist and both Bruce and Seth raise money for medical charity causes. Bruce's background as a musician and his natural talent and training as an actor make him an ideal choice for "Joe", a disenfranchised musician who after hitting bottom in this dark night of the soul is forced to reevaluate his life. Though Bruce has starred in several other feature films, "Midnight Reckoning" is Bruce's first leading role in a feature film. And with a superb performance like this, we can count of seeing Bruce as a leading man in many more roles in the future. His publicist is Michael Conley at (818) 389-3577. Bruce is seeking new management/agency representation. PERSIA WHITE, ("Dawn") a talented and accomplished actress, is perhaps best known for her regular leading role of "Lynn" on the CW Network's successful Monday night TV series "Girlfriends" which ran for eight seasons. But Persia has also been on other recognized TV series like: "Another World" and "Breaker High", and has been in TV Movies like: "Operation Sandman", and "Suddenly". She has feature film credits in "Red Letters", "Stalled", and "Blood Dolls." She also is starring in two upcoming features in 2010 and 2011 "Guardian of Eden" and "Dysfunctional Friends". Persia also has extensive TV guest starring roles on TV shows like "Angel", "Clueless", "Steve Harvey Show", "Buffy the Vampire Slayer", "Burning Zone", and "NYPD Blue" and many others. Persia though recently best known for her comedy acting skills, shows in "Midnight Reckoning" that she can plumb the depths of powerful drama. Keep an eye on Persia. With her versatility and talent we will be sure to see a lot more of her on the big screen. Some have spoken of her as the next Halle Berry. If that's the case, she's already well on her way. Of "Midnight Reckoning" Persia says: "I was immediately attracted to the role because I saw a rare and complex character woven in a very interesting story. In Hollywood this is a rare and beautiful thing." TONY LONGO ("Atlas") is veteran actor with numerous feature credits including: "How to Lose a Guy in 10 Days", "Food Fight", "Mulholland Drive", "The Cooler", "Pizza with Bullets", "Road to Redemption", "House Guest", "The Marrying Man", "Angels in the Outfield", "Let It Ride", "Eraser", "The Last Boy Scout", "Mr. Destiny", "Fletch", "Feds", "Fangs", "Unlawful Entry", "Suburban Commando", "Sixteen Candles", "Bloodhounds of Broadway", and many, many more. And he's starring in a new film "Jake's Corner", and featured in Lionsgate's 2008 release "Foodfight". He also has a leading role in the new Kevin Sorbo film "Changing Hands." 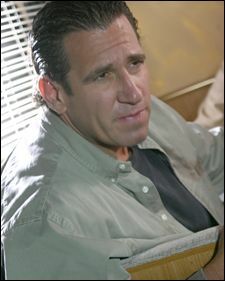 Tony also has an equally impressive number of TV credits with regular series roles on: "Police Academy", "Helltown", "Phil from the Future", "1st and Ten", and "Force Seven"; recurring TV roles on: "Young and the Restless", "Shakey Ground", "Heart of the City", and "Alice"; and starring TV Movie roles in: "Young at Heart", "Bad Attitudes", "Peter Gunn", "Triple Cross", and others. In addition Tony has had many Guest Starring roles in TV series like: "Crossing Jordan", "Las Vegas", "Monk", "Six Feet Under","ER", "X-Files", "Family Matters", "Nash Bridges", "Coach", "Empty Nest", "Young Riders", "Night Court", "Simon and Simon", "Hanging with Mr. Cooper", "Fresh Prince of Bel Air", "The Equalizer", and many many more. In "Midnight Reckoning" Tony plays the enigmatic Atlas, a big, gruff guy with a shady past who now has the ability to foresee certain future events with apparent 100% accuracy. Tony turns in an amazing performance of this complex character, whom Joe at first mistakes for merely another redneck. Tony says, "Remember God's clock is in a different time zone, but it's always on time." And regarding The Fall of Night he mused, "How many people were just in that motor home? Can someone turn the air on?" Tony can be contacted through his talent agency, JLA - 310-276-5677. 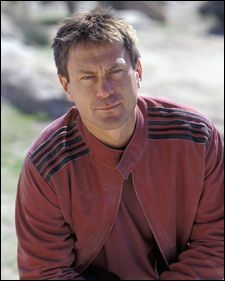 Though GRANT BOWLER, ("Harry") an Australian native from the famous Bondi Beach, has an impressive list of overseas feature and TV credits, he has his American feature debut in "Midnight Reckoning". How American directors missed this acting treasure from "down under" till now is truly a mystery. 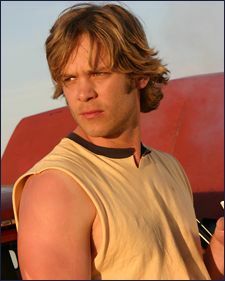 Grant recently starred in the U.S. release of the big budget feature "Atlas Shrugged" However, he cut his teeth in leading roles in overseas features like: "Calling Jerry Malloy", "Ned", "Close Contact", and "Change of Heart". U.S. TV credits include the recurring roles of Captain Gault "Lost" and Connor Owen on "Ugly Betty"; and Cooter on "True Blood." Overseas TV credits include being a series regular on: "Outrageous Fortune", "All Saints", "Always Greener", "Medivac", and Blue Healers". For three seasons was the host of reality show "The Mole". Grant also has extensive stage experience with both contemporary plays and Shakespeare. And yes, he does both an American and an Aussie accent flawlessly. As his part of Host on "The Mole", and his picture above would suggest, Grant is a hard one to read. So, he's ideal for the wily, sly, and inimidating Harry. And indeed Grant turns in a first rate performance of a character that is hard to shake from your mind, even after the film is over. "Independent films are at their best, and fulfill their charter, when they are unafraid to offer a view, or a moral standpoint, lacking in films more concerned with their bottom line. The Fall of Night is a courageous film. It dares to offer a clear moral universe, asking its characters to answer the big questions, about life, redemption, right & wrong. What I liked most about playing Harry was that he is a reasonable man. He offers all the solutions and consequences that reason offers." Grant's agent is Don Buchwald & Associates. AL HARRINGTON, ("Jesse") a native Hawaiian and veteran actor, burst into national prominence as Detective Ben Kokua, a series regular on "Hawaii Five-O" back in the mid-1970's. Since then he has had numerous guest starring roles on series like: "Scrubs", "Family Law", "Magnum PI", "The Jeffersons", and "Jake and the Fatman", and narration for the History channel's "The Conquest of Hawaii." He's also had TV Movies like "Escape from Atlantis" and "The Byrds". Al's filmmography is equally impressive with credits like: "White Fang II", "Creator's Game", "The Long Road Home", "Hawaiians", "Hawaii", "Nate and the Colonel", and "Satin". He recently starred in the 2006 film "Summer of the Eagle". Al's versatility is shown in that he also hosted a variety show at Waikiki in Hawaii for twenty years. Al also spends his spare time helping out with the American Heritage Foundation raising scholarship money to help high school students visit the nations capital. 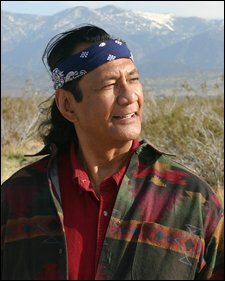 In "Midnight Reckoning", Al plays a mysterious American Indian who seems to appear at just the right moment the story. Al's depth and subtly make him a perfect fit for this role.